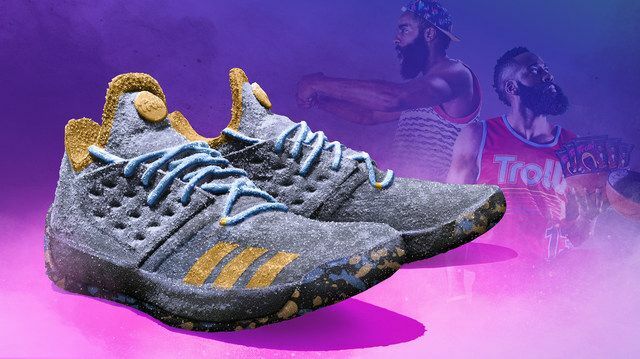 To celebrate their celebrity spokeperson's recent MVP award for the 2018 NBA season, Trolli just released a limited-edition giant gummy replica of James Harden's actual basketball shoes. Each pair of candy shoes weighs almost 12 pounds and can be found only at Amazon.com for $2,677 per pair (the price matches the number of points James Harden scored last season). Each shoes features a combination of raspberry, lemon, strawberry, and blackberry flavors. Proceeds from the sale go to the basketball player's charity: 3 The Harden Way. According to the listing on Amazon, ingredients for the shoes include: "Ginormous Amounts Of Swag, Style Liciousness, Sour Brite Flava, The Stuff Legends Are Made Of, Beard, Sweat and Tears, Dopeness, State-Of-The-Tart Candy Technology, Side-Eye Enhancement, MVP-Like Confidence." The candy brand also manufacturers more affordable, smaller shoe-shaped and beard-shaped gummy candies promoted by James Harden (who is known for his signature beard).